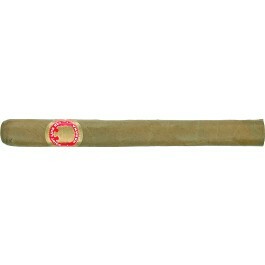 The Saint Luis Rey Lonsdales is a mild-medium bodied and very aromatic Cervantes, 6.5” (165mm) long, of 42 ring gauge, and comes in a 25 cigars box. These are aged cigars. The box code that we have in stock are: APE-MAY-01. Discontinued since 2006, its mains flavors are of hay, honey, chocolate, tobacco with a pinch of spices. There are also hints of earth, wood and leather. • Pretty complex cigar, floral flavors, also coffee, cocoa, hay, and lots of salty earthiness. • The ageing process of the cigar made it creamier and delicious. This cigar is simply a gem; anyone who has not tried it yet should try it. The cigar is looking good. The wrapper has a medium brown color, with some reddish tints and is pretty smooth and with a thin oil sheen on it. The construction of the cigar is all right, a nice looking cigar, pretty packed at the foot. The wrapper smells of dry hay, bread, milk chocolate, hazelnut and molasses. Once cut, the draw is just a bit too open. The pre-light aromas are of dry hay, sourdough bread, leather and some creamy sweetness. When lit, the burn line is good, and does not require any touch-up. This cigar generates a good amount of smoke, the ash at the foot is greyish white. During the first third of the cigar, the draw, that was previously a bit too open, has now tightened up a bit. The strength of the cigar is at a medium level. The dominant flavors are of earth, dry hay, floral flavor, reminding of tea and some cloves. There is also a nice sweet profile to it, with some honey, molasses, toffee and some hints of roasted bread and nuts. The first third is very interesting and enjoyable. The finish is long and sweet. In the middle third, the flavors evolve, the sweetness that was present in the first third fades away and some slight saltiness comes instead, with some more earthy and bitter chocolate flavors. There still a strong floral characteristic, some leather, toast aroma. And the dry hay from the first third becomes more a fresh cut hay. There are also notes of nuts. The finish is still very long and chewy. Overall, the aromas are now richer and deeper, but the strength of the cigar remains in the medium level. In the final third, the flavor profile remains similar, the cocoa is now stronger, the toast bread tapered off. The floral notes are also becoming more prominent, there is an addition of strong coffee notes, and some overall saltiness, kind of like sea salt. No more sweetness at all. The last third is very enjoyable, and a bit stronger than the first two thirds, closer to a medium full smoke in strength. In summary, a nice aged cigar that is not too strong and has a nice earthy tone with lots of floral notes.